One of the hardest things to do as a designer/artist is brand yourself. At least it has been for me. Who the hell am I and how do I want to represent myself to the world??? I still haven't figured that our for my graphic design persona. But the artist brand is emerging. 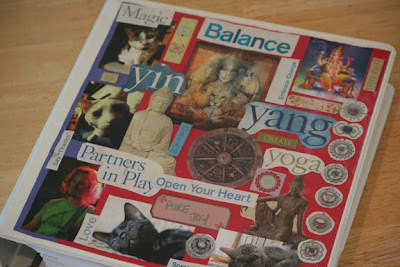 It started when I was in yoga teacher training and the first weekend we did a collage for the cover of our binders. Then we did another collage the last weekend for the back cover. 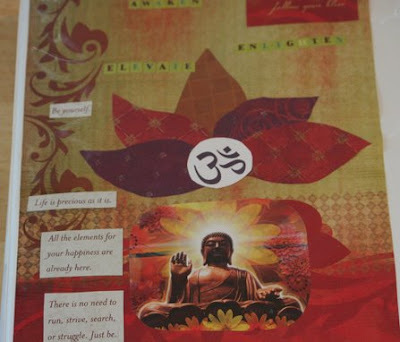 Both of my collages were similar in that they had images of Buddha, lotus flowers, Oms, chakras, my kitties, my hubby and other symbols and art that are meaningful to me, mostly of eastern and pagan influence. Oh and the colors ... I love deeper, saturated colors, especially reds and oranges. They are the photos for today. Since I started this blog, I have been contemplating the design of it. I wanted it to show who I am. I could have easily slapped a design up, after all, I am a graphic designer. And I did that, clean and simple, but the style of design that I do for work isn't really who I am inside. Finally, a few weeks ago I thought of those collages from teacher training. That's who I am. And I could use my design skills to make my blog art. And today, finally after over 4 months of posting, here it is!! I am though, constantly evolving. So this art and the blog are likely to evolve as well. But this is a start and it's a start I am really happy with. I like your new look alot, Mina! And I agree it illustrates who you are quite well!